Hummus is a nutritional food. Hummus or houmous is a Levantine and Egyptian food dip or spread that includes chickpeas, sesame seeds, olive oil, lemon juice, salt, and garlic. It is an Arabic and Mediterranean dish. It is an Arabic word meaning chickpeas. It is high is different types of nutrients, for instance, protein, iron, vitamin C and B6, and dietary fibre. Here on this page we will see some of the important health benefits of hummus. Hummus is often eaten with pita, bread and frequently flavored with cumin or other spices. It is also served as part of a meze or as an accompaniment to falafel, grilled chicken, fish or eggplant. Garnishes include chopped tomato, cucumber, coriander, parsley, caramelized onions, sauteed mushrooms, whole chickpeas, olive oil, hard-boiled eggs, paprika, sumac, olives. It is so rich in protein, it can help fight hunger cravings and balance blood sugar levels. It is a good source of proteins for vegans. It helps boost your energy, which could make you more motivated to hit the gym. 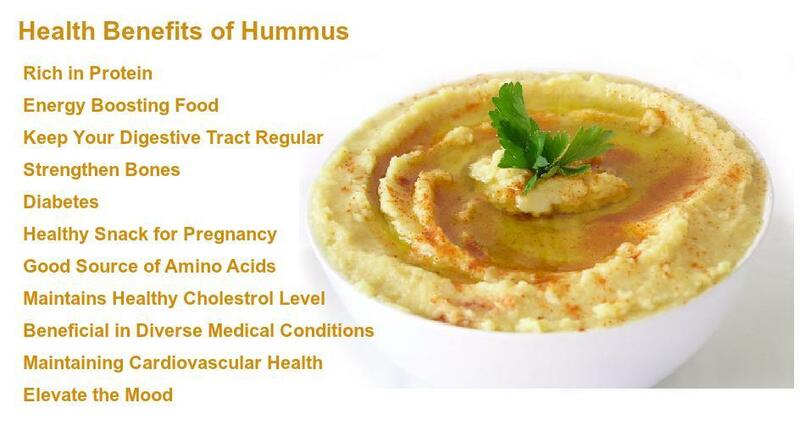 Health benefits of hummus include improved digestive system and keep your digestive tract regular. Fiber itself has other health benefits like helping to prevent heart disease. Health benefits of hummus include strengthening bones and muscles. It can help improve your bone, muscle, skin, and blood health. It helps in the regulating the blood sugar levels. Folate-rich hummus helps in preventing the threat of birth defects in the babies. The base of hummus chickpeas is a source of amino acids which are important for building healthy muscles and tissue. They are also rich in protein. Chickpeas are also known to be effective in preventing build up of cholesterol in the blood vessels. Hummus has been found to be beneficial in diverse medical conditions including cancer, diabetes, inflammatory disorders such as rheumatoid arthritis and hypertension. Another active ingredient that is present in hummus is olive oil which is rich in anti-inflammatory omega-3 fatty acids. olive oil which helps in maintaining cardiovascular health. The amino acids present in hummus helps elevate the mood and promotes better sleep.